Put a smile on the faces of your friends and family when you serve them delicious, fluffy, hand-spun cotton candy in three popular flavors - Pink Vanilla, Blue Raspberry, and Grape. You�ll even have the classic paper cones to serve them! Pair this kit with the home-use Carn�s Cotton Candy Maker to quickly and easily make yummy treats for everyone young and old. 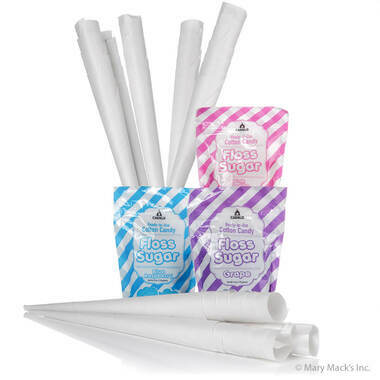 Each of the three floss sugar flavors comes in a convenient, resealable zip pouch to store and maintain freshness, and contains 12 servings of cotton candy. The entire fun kit can make approximately 36 small to medium size servings. These classic flavors are terrific when enjoyed individually, or if you're feeling spunky try combining them and creating a layered cotton candy treat!